Is the US forgetting the wars in Iraq and Afghanistan? 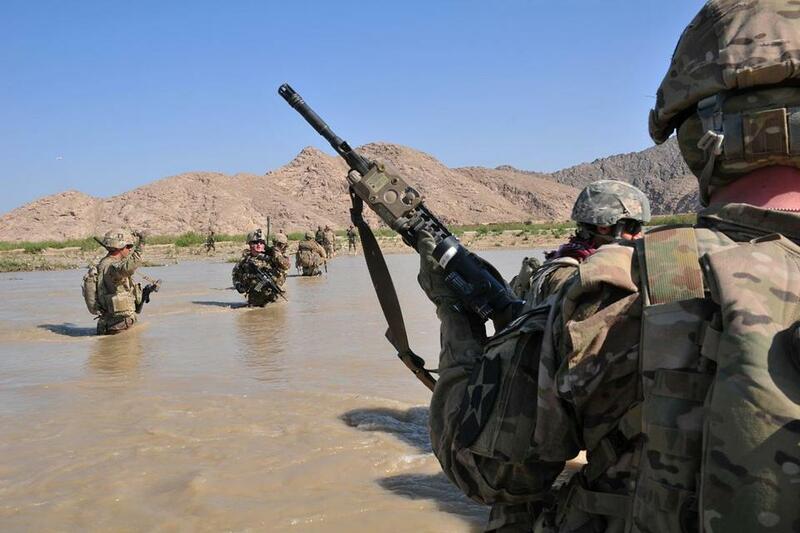 On April 10, 2013, US soldiers crossed the Tarnak river in the Panjwai district of Kandahar province, Afghanistan, on a two-day mission to clear the area of explosives caches. Ten years ago in “The Three Trillion Dollar War,” economist Joseph E. Stiglitz and I predicted — controversially — that the wars in Iraq and Afghanistan would cost far more than anyone expected. Fast forward to today. The total bill has spiraled to over $5 trillion, most of it paid for on the national “credit card.” Nearly 7,000 American troops and a similar number of contractors have given up their lives. With no political end game in sight, more than 15,000 troops remain on the ground. And yet Congress pays almost no attention to the wars — even though the cost continues to run at more than $70 billion a year. Despite all this, there is a deafening silence on the wars from our political leaders. General John Nicholson, who recently stepped down as commander of American and NATO forces in Afghanistan, did not have a single meeting with President Trump in 20 months. Compare this to the Korean and Vietnam wars, when Presidents Harry Truman, Richard Nixon, and Lyndon Johnson used their annual State of the Union addresses to highlight the expense of the wars and how to pay for them. 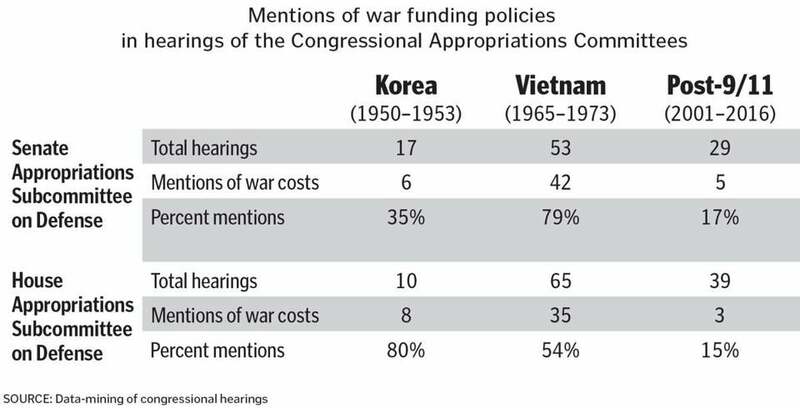 Powerful congressional committees held multiple hearings on the cost of the Korean and Vietnam wars, and Congress helped end the fighting in Vietnam by asserting its “power of the purse” to cut off funding. By contrast, in the past 17 years the Senate and House Appropriations Committee subcommittees on defense have focused on the costs of Iraq and Afghanistan in just a handful of hearings. The same pattern exists in the fiscal authorizing committees. The conspiracy of silence has been made possible by two factors. The first is the unprecedented budgetary process used by Congress to fund the conflicts. In past wars, most of the money to pay for military operations was appropriated from the regular military budget. This meant that lawmakers were obliged to make difficult trade-offs, cutting domestic programs and nonwar military spending in order to prioritize the wars. In the current wars, between 2001 and 2011, trillions of dollars were spent using “emergency” appropriations — a process normally reserved for unexpected natural disasters such as hurricanes, when money is required quickly and with minimum oversight. Since 2011, Congress has been using a special “Overseas Contingency Operations” fund that is also exempt from regular budget constraints. The fund has also been a magnet for Congress to spend money on programs unrelated to the wars that it can’t force through the regular budget. Second, the wars have been funded almost entirely by borrowing. The huge glut of savings around the world has enabled the US Treasury to borrow almost unlimited amounts of money at rock-bottom interest rates. So while the national debt has been raising rapidly, the total interest cost has held steady. The borrowing binge also made it possible for the George. W. Bush administration, and now the Trump administration, to enact substantial tax cuts — the first time in US history that taxes went down during wartime. During the Korean War, for example, Truman raised top marginal tax rates to 92 percent. In Vietnam, Johnson reluctantly imposed a surcharge that hiked top rates to 77 percent. In both cases, these taxes were enacted specifically to avoid burdening future generations with the legacy costs of the wars. 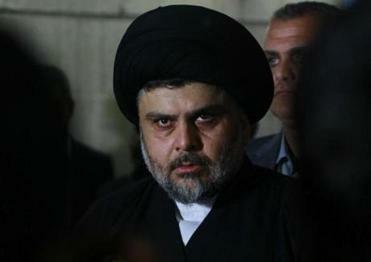 Throughout the Iraq war, al-Sadr was a high-profile villain. Now everybody — including the United States — has just gotten used to him. Today’s shadow budgetary process combined with easy borrowing has enabled the United States to pay for the post 9/11 wars quietly, with little political debate. So it’s hardly surprising that the media and the public aren’t paying attention either. Afghanistan has not ranked among the top 20 broadcast media stories for the past three years. According to a recent Rasmussen poll, 42 percent of the American public believes we’re not at war in Afghanistan or they are not sure. Meanwhile, Afghanistan and Iraq remain in turmoil. The Afghan government is fighting intense battles across most of the country. Hundreds of thousands of civilians have been killed, and millions are still displaced from their homes. The war has become a quagmire and a permanent state of affairs for the US military. Nearly one million American men and women have been injured in some way; providing these new veterans with lifetime disability compensation and health care will cost another trillion dollars or so over the coming decades. There is no easy answer to the troubles in Iraq and Afghanistan. But we should be having a national conversation about just what we are trying to achieve, and whether it is truly worth the price. As a nation we can’t possibly decide on the most important questions over war and peace if no one is paying attention. Why is the Islamic world still torn by war? Linda J. Bilmes teaches public finance at the Harvard Kennedy School and is coauthor of “The Three Trillion Dollar War.” Her latest book, “The Ghost Budget: Paying for the Wars in Iraq and Afghanistan,” will be published in 2019.